Buried at KANCHANABURI WAR CEMETERY, Thailand. 2. N. 72. Aged 31. Son of Herbert and Florence May Dorling, of Brandon, Suffolk. 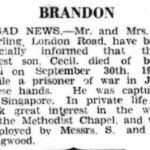 Cecil’s birth was registered in the spring of 1912, and he was the nephew of William Dorling who was killed in WW1, and who’s name features on Brandon’s war memorial. Cecil’s father was a gamekeeper named Herbert (died 1976) and his mother was named Florence May (nee Tash, died 1962). Cecil was a member of Brandon’s Methodist Church, on the London Road, and according to the Bury Free Press, in 1942, he was Society Steward of that church. Cecil joined the army as a Territorial when the threat from Hitler’s forces loomed over Britain. As a Territorial he would have remained on UK soil, manning beach defences, training in warfare or even helping farmers with the harvest. When the threat of invasion diminished then the Territorials were directed to enter into the theatre of war. For Cecil and many other territorials from East Anglia, serving in the Norfolks, Suffolks or Cambridgeshires, this looked like being North Africa and Egypt. However as the Territorials were on the sea events took a turn in December 1941, when the Japanese bombed Pearl Harbor. Singapore now looked vulnerable, so the Territorials were diverted there. In February 1942 they landed with few weapons and within weeks had surrendered to the Japanese. Cecil was destined to spend the rest of his life as a prisoner of the Japanese. Singapore was wracked in chaos and news slowly filtered out. There was no word about the fate of individual soldiers, who were listed as “missing”. Cecil’s family knew nothing of his welfare and it was only at the end of the war that his parents learned of his fate. The ‘Bury Free Press’, in their 24th August 1945 edition, just a week before VJ-Day, reported that Cecil had died of Beri Beri, almost two years earlier.